It is also held by popular belief that Su – refers to good and Dur – to bad. Duryodhan and Suryodhan are both names for the same person and often used interchangeably. Suryodhan means one who is good with arms (in warfare) and Duryodhan means unconquerable warrior. Naturally there can be many who are good in battle but only ONE who is unconquerable. Hence, Duryodhan being more unique, stuck. buried. Gandhari’s children were thus born in these jars over a period of time. After years meditating in the forest, Pandu asked all his sons to eat his flesh when he died. By doing so they would be blessed with great knowledge. But when Pandu died none of his sons had the courage to do so. Later on when Sahadeva saw some ants taking a piece of flesh from his fathers’ body, he put that piece in his mouth and got powers which he could never have imagined. He saw all that had happened(about kuru and yadava’s, Bhishma’s vow etc.) and was about to happen (gambling loss, Kurukshetra war, etc). When he met Krishna, he was made to vow to never speak of anything he knew and if anybody asked a question he would always reply with a question. As he knew all that was about to happen, he used occult sciences to show people how a small ripple lead to a disastrous or good result. There is an ancient story which says there was a demon king who performed a severe penance to appease Surya and obtained a boon that he could have 1000 lives and a kavach in each life so that nobody could kill him without doing a penance for a 1000 years . Also each battle to kill him would last a 1000 years. Once he started rampaging , the devatas approached Vishnu to save them . 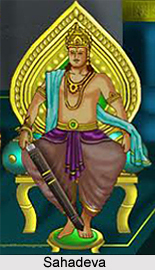 As a result Vishnu took 2 forms – Nara and Narayana . Initially Nara performs a penance for 1000 years while Narayana killed the demon king. Then Narayana went into penance and Nara killed him. This happened for a total of 999 times. When he was about to be killed the last time, the demon prayed to Surya who saved him from Narayana. He was then born as Karna in Mahabharata while Krishna was Narayana and Arjuna, Nara . Gandhari had been married to a goat before getting married to Dhritarashtra. The goat had been sacrificed promptly thereafter but this made Gandhari a widow and Dhritarashtra her second husband. So when they came to Hastinapur as guests, Bhishma locked all of them up. But since it was considered a sin to starve your guests, Bhishma did send food daily, but kept on reducing the quantity. When the family realised this trick, they decided to feed a single person who would survive and avenge them. They selected Shakuni, the youngest and cleverest son. Broke his leg to always remind him in every step of his life, the atrocities committed by the kuru clan. Before dying his mother asked him to take a particular bone from her body, which would always listen to him. He made dice from that bone and those dice always fell on the number he wished for. Armed with dice and revenge, he set upon bringing down the clan by sparking a war between the cousins. 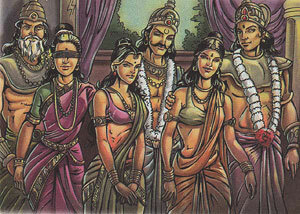 Upon Vichitravirya’s death Satyavati summoned Vyas (who happened to be her eldest son) and informed him of his duty to impregnate Ambika and Ambalika in order to grant an heir to Hastinapur. Dhritrashtra was born blind because his mother Ambika was terrifed when she saw Vyas and shut her eyes in fear. Pandu was born slightly frail as his mother (Ambalika) shuddered when she saw Vyas. The third time the two of them decided to send a maid instead of going themselves , the maid went on to give birth to Vidur who would later become the prime minister of Hastinapur. Barbarik who was the grandson of Bhima expressed his desire to watch the war of Mahabharata to his mother and promised that he would join the side that was weaker if he felt the urge to join in. Krishna wanting to examine Barbarik’s strength in person, disguised himself as a Brahmin and approached him. When he asked how long would it take to finish the war if Barbarik were to fight it alone, he replied it would take him only a minute. Krishna was surprised at this answer, considering the fact that Barbarik only had 3 arrows and a bow. To this Barbarik explained that one arrow was to mark all the objects that he wanted destroy, the second arrow was to mark all the objects that he wanted to save and the third was to destroy all the objects marked by the first arrow. Krishna amazed by his prowess, explained that since he was the greatest warrior on the battlefield, which ever side he joined would make the other side weaker. So eventually he would end up oscillating between the two sides and destroy everyone except himself. Krishna then asked for Barbarik’s head in charity to avoid his involvement in the war, which he then placed atop a hill with the battlefield in full view.